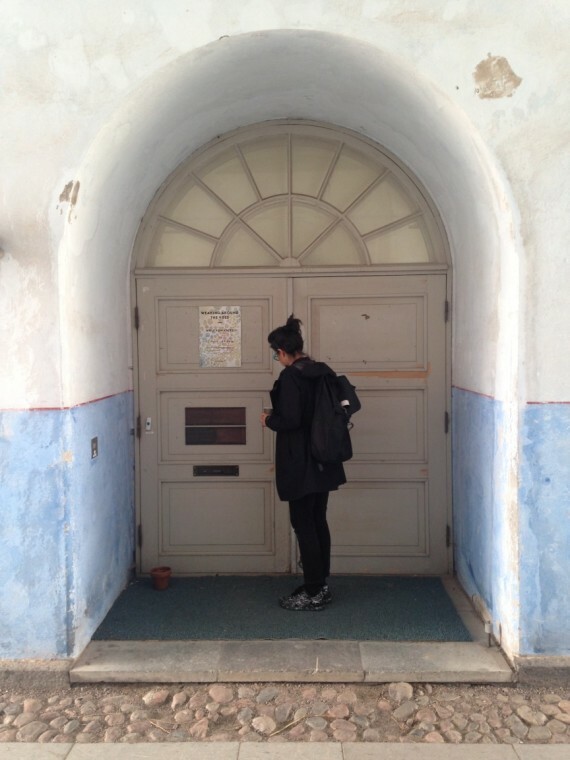 I am researching and developing a supported residency for artists who feel unable to participate within existing programmes. This will be developed with Islington Mill in Salford and the Artists Association in Tampere. Supported by Arts Council England. 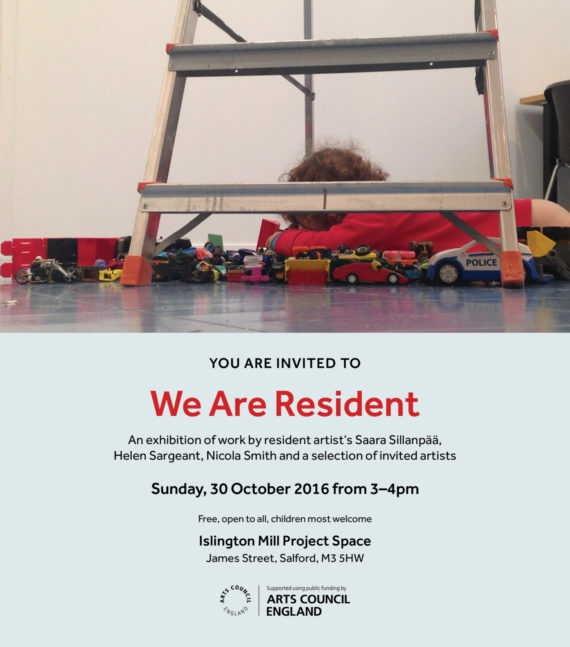 Saara Sillanpää and her family where artists in resident at Islington Mill between 23rd October – 4th November that was hosted by We Are Resident. I was really excited to pick them up from the airport as we had been planning this for months so to actually get this residency started felt good. The B&B has a really warm and cosy feeling which has a welcoming atmosphere as soon as you walk through the door. Saara’s youngest son is the same age as Cassius and with my experience of travelling with him I brought a few extras for the children such as toys, books, nappies, baby wipes etc. My husband made soup for the family so they didn’t have to cook, which meant they could eat, unpack and settle in quickly as it was quite late, 6pm when they arrived. 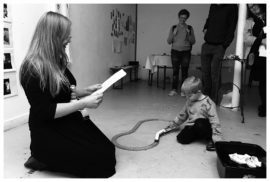 I introduced Saara to the studio space which was the gallery, and the first activity session the following day was for the children to work with artist Trae England-Shortt, Shed Play. The concept behind the sheds was that the children had their own spaces to work in with dad Laurent that would allow mum, Saara to work. Planning is all well and good on paper however the reality of actually doing a residency with the family creates a different dynamic and demands on your time as an artist mother. 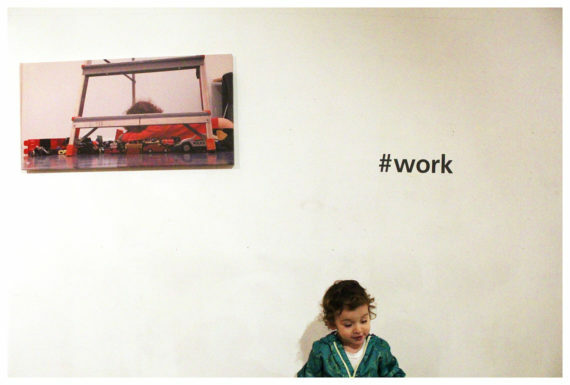 Saara talks about the struggle to balance making work and being with her family on her blog http://familygoesart.blogspot.co.uk . As the facilitator of this project as the week went on I too struggled with trying to keep everything going with a death in the family and my son being unwell the night before the We Are Resident event. There was a point on Saturday night when my son was really poorly I briefly considered cancelling the event, as I didn’t think I would have the energy to get through it all. Although with supportive friends and family I got it together to make the event happen which I feel was a success. 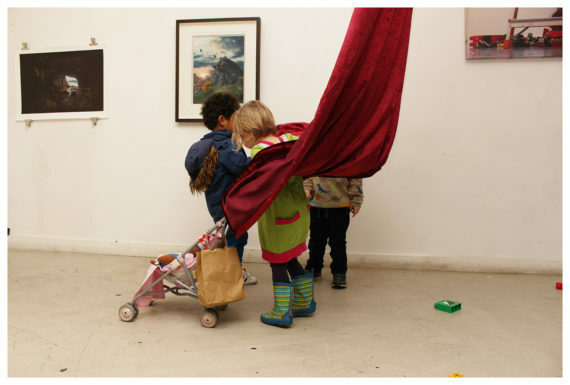 At times the event felt like a live art happening with children running about and playing with the artwork but felt really important that both artist parent and child could be themselves in the gallery space. I was really happy that the invited artists came to share there work which made the event very special and I have to say a big thank you to Jessica Longmore, Alice Bradshaw, Andrew Brooks, Hannah Connor, Julian Hughes, Tabitha Moses. 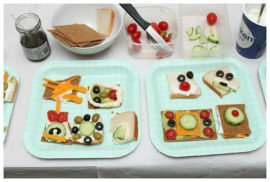 Saara Sillanpää made beautiful sandwiches with her family for people to eat and Helen Sargeant performed a reading from her blog she certainly was a mother magnet. I really had no idea if Cassius would perform alongside me and my husband for #work but with a little encouragement from my brother it all went to chaotic plan. 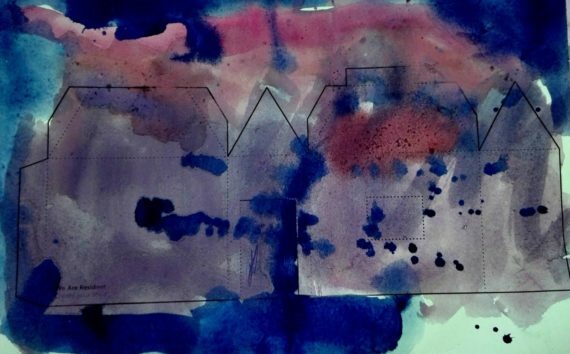 As part of developing links between We Are Resident, Islington Mill, and St Philips C of E Primary School we had been developing an art project with the nursery class. Through spending time at Islington Mill I was inspired by their Pot Luck dinners and Helen Sargeants work making bread. The title of the school project was Breaking Bread and the aim of the event was to bring together children and their families in a meaningful way to share bread from each other’s cultures in a fun, creative and social way. 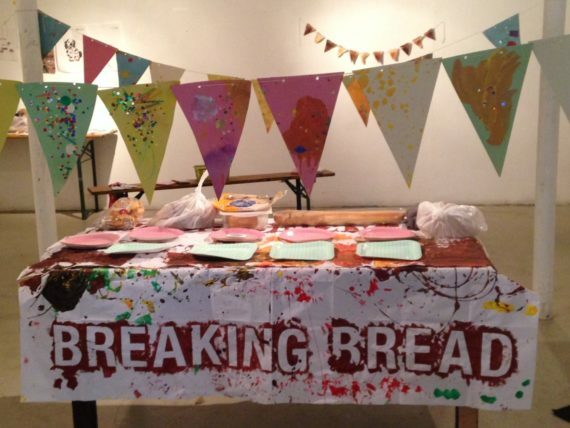 A celebration event at Islington Mill gave the children the opportunity to create their own event by making a large-scale painted tablecloth, bread gift bags, and bunting. Helen Abbott the art teacher I had been working with on this project introduced a book to read at the gallery titled the dot, which is a story about how anyone can be an artist just by starting with a small dot. This story reflected how the children had started by making small which led to a large-scale event. Everyone brought there own breads including the Finnish family and the nursery class made there own bread with the parents bringing there own contributions. At the end of all the tasting everyone voted for their favourite bread. I have taken time out from blogging as it has been impossible to keep it up with all of my time taken up with project managing the residencies, planning a school project, developing a new performance and finalising the closing event, oh yes and don’t forget looking after my child. 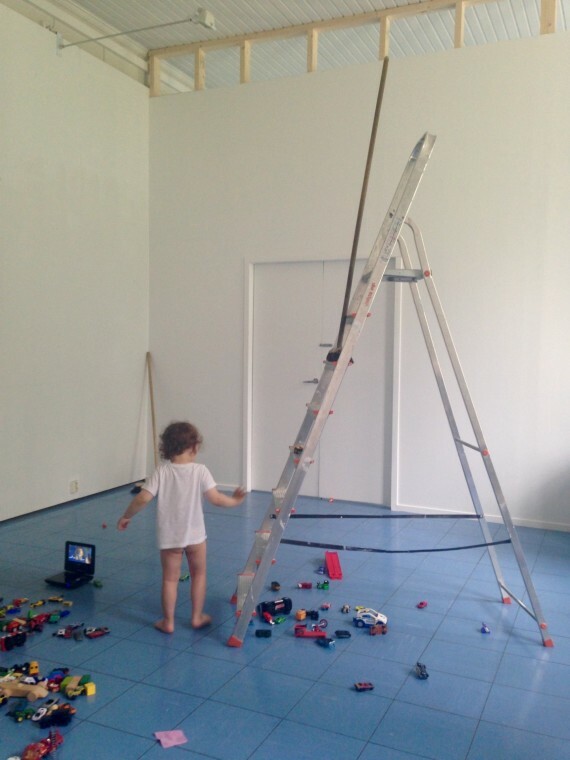 My last post documented my research residency in Tampere, Finland and then shortly after this Helen Sargeant and her son Naoise went on their micro research residency for 2-weeks. 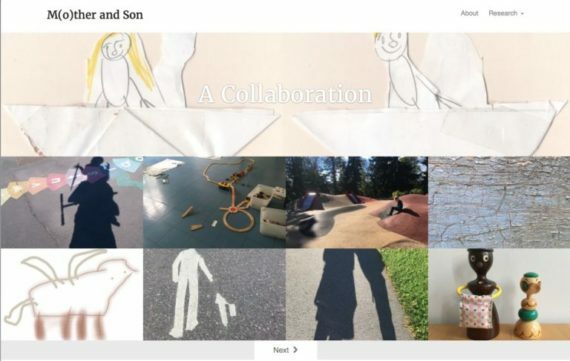 Helen documented her experience on this new blog titled M(o)ther and Son: http://helensargeant.co.uk/motherandson/ The blog is a very honest account of the highs and lows of making work with your child in a new environment. At times I found it difficult to read as I wanted to make the residency the best it could be, however I have to remind myself that this is a research and development project and the work was not only the doing of the residency but more importantly what can be learnt from the experience. Often we do not see or hear about the challenges of starting a new project as this information is often glossed over or edited out. On our way back home we stayed one more night in Helsinki that gave me a chance to catch up with my artist mother friend Anna Puhakka and a research visit to HIAP Helsinki International Arts Programme located on the island of Suomenlinna. My on-going fascination with Finland really started with Anna being the first Finnish person I had ever met when we did our fine art degree together at Sunderland University back in 2007. We talked over drinks about possible collaboration in the future and it was really exciting to have those ambitious ideas again for exhibiting as often I find it difficult to sustain an interest in re-showing my own work. Although a two-person show could be an interesting visual dialogue and how that could work structurally with a new collaboration to bring our two practices together. Anna suggested starting a process of writing about each other’s work and we both spoke of having someone else curate our work into one show, would this be possible, could this actually work? It was nice to think about the possibilities and reminded me how important it is to keep having these kinds of conversations with your peers. 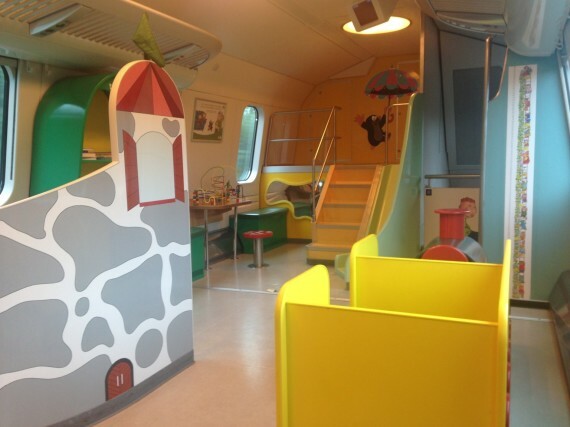 This may seem random but I have to mention our journey from Tampere to Helsinki and how child friendly it was. In the main ticket hall in-between the seating are many wooden train sets for the children to play with. On the train my son was given his own train ticket and had a lovely interaction with the conductor giving Cassius just as much attention as the adults. On the futuristic looking double decker train on the top deck was a play area with a slide and everything where my son played for almost an hour of the journey. This was quite overwhelming to see and again is an example of how children’s needs are met in the form of specifically designed spaces for them. Too often we expect children to fit into an adult world and I feel the UK could really learn how public areas are designed in Finland. 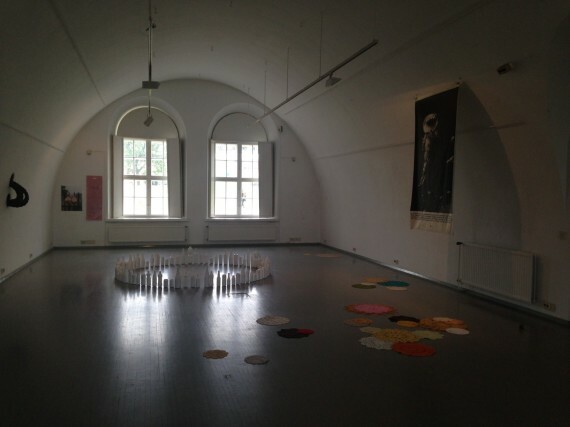 On my last day I met with Marina Valle Noronha, curator at HIAP and we took a short boat ride to the island of Suomenlinna to see the residency spaces and current exhibition Weaving Around The World in gallery Augusta by artist Wolf Von Kries. The island is a heritage site and you really feel this as you walk over the cobbled stones with tourists taking pictures of the many beautiful buildings here. On the island there is an art school and buildings are privately owned with people actively living on the island. The HIAP building is an elongated pastel pink structure with archways flowing within it and we entered a side door into the exhibition space, which is open to the public. 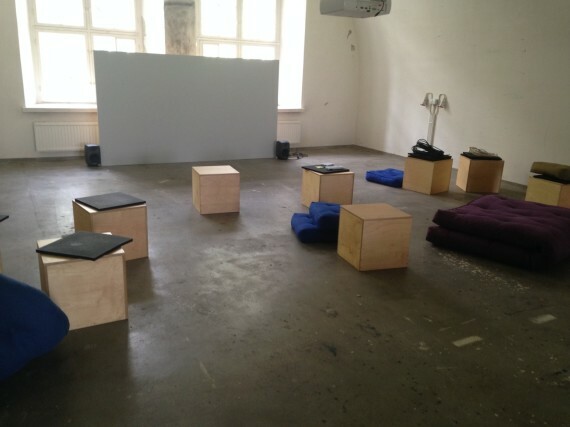 I really liked how the project space and artist presentation area flowed into one another furnished with wooden cubed cushioned seats, the ceiling covered by fabric sales, which changed the feel of the room. Artists’ in residence live in there own house within a row of them where other visiting artists stay. Inside the house it is split between a downstairs studio space and upstairs accommodation. A current artist in resident is here with his family and they have two houses next door to each other with a corridor that adjoins them. 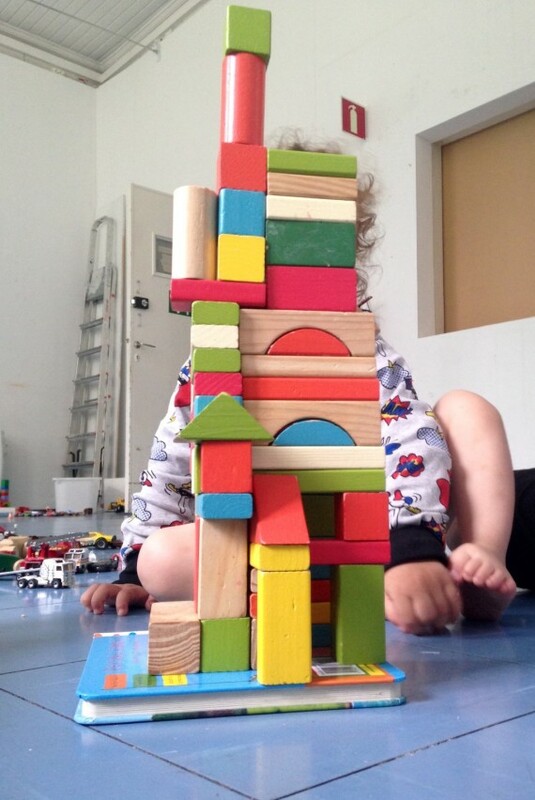 The family are struggling to find activities for the children, as it is summer time here with the schools on holiday break and the language difference has made it difficult to understand exactly what is required although this relationship is developing with time. I thought this could be a good way to find out about the challenges of having a family here from an organisational perspective and from the family’s point of view. HIAP facilitates a vast range of residency programmes for national and international artists’ that feels like a good place to learn from such a well-established organisation. As a family we have been getting re-acquainted with our surroundings and making a mental note of the places that will be of interest to the following artists’ in resident. I had plans of hand making a map although I feel something more factual is needed such as Google maps, images of landmarks on the way to a particular destination. There is plenty available within walking distance from the accommodation such as the bus stop, a small play area, supermarket, and lake all within a mile radius. Takahuhti is located within a park and Cassius is very happy to play on the grass and run around the trees. Walking in suburbia or in the city we regularly come by really well designed play areas not only for the children but also for the adults for example the spaces are softly framed by greenery with wooden benches to sit on. The flooring is always covered with sandy stone material which the children can dig or draw into that is soft under your feet when you walk across it. 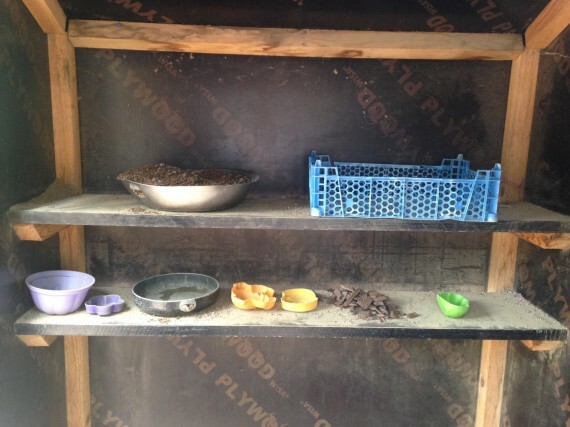 I particularly liked this wooden Wendy house structure which had different pots, boxes, scoopers to collect materials in with shelves to place them onto. These play areas are places that a family would want to spend time in unless your child is having a continual tantrum about sharing the swing. The main focus of this research residency is to re-connect with the Tampere Artists’ Association in person as there is only so much that can be organised by email correspondence. On Monday I met with Arja, the director of the association at there offices at Maltinrantaa where there are two galleries, atelier rooms, shop, art lending services and printmaking facilities. The meeting went well and I felt they where supportive of this project offering more of a higher profile space at Maltinrantaa for the resident artists to present there work. 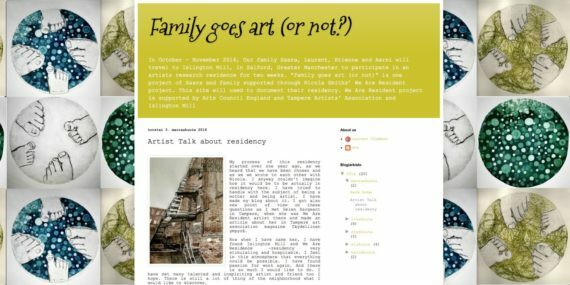 I was surprised to hear that blogging about artistic practice was not very common in Finland although the association are keen to write an article about this project which will feature in the free monthly arts magazine later in the year. During our meeting I was introduced to some artist mothers who where very enthusiastic about the idea of a family residency there was also a visiting artist from Dussledorf where there are many artist exchange programmes that I must research further into. Finally I got to meet Saara the Finnish artist mother to discuss her upcoming residency at Islington Mill. 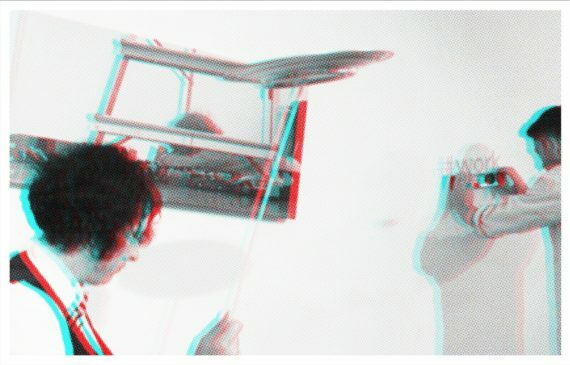 My practice responds to the context of my surroundings using different mediums such as live art, installation and video. I perform in public and private spaces performing as the ‘host’ by presenting workshops, actions and talks in an engaging way using live art techniques.